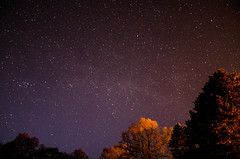 This month brings the final truly dark night skies for Scotland until mid-July or later. Our dwindling nights are dominated by Jupiter, bright and unmistakable as it passes about 30° high in our southern evening sky and sinks to the western horizon before dawn. Venus is brighter still but easily overlooked as it hovers low in our brightening eastern dawn twilight. Saturn is also best as a morning planet, though it rises at our south-eastern horizon a few minutes before our May star map times. Saturn creeps westwards from the constellation Sagittarius into Ophiuchus this month and brightens a little from magnitude 0.3 to 0.1, making it comparable with the brightest stars visible at our map times – Arcturus, Capella and Vega. The ringed planet, though, climbs to only 12° high in the south by the time morning twilight floods our sky, which is too low for crisp telescopic views of its stunning rings. On the morning of the 14th, as Saturn stands only 3° below-right of the Moon, its rotation-squashed globe measures 18 arcseconds in diameter while its rings stretch across 41 arcseconds and have their northern face tipped at 26° to our view. Saturn’s main moon, Titan, takes 16 days to orbit the planet and is an easy telescopic target on the ninth magnitude. It stands furthest west of the disk (3 arcminutes) on the 3rd and 19th and furthest east on the 11th and 27th. The Cassini probe is now into the final chapter, its so-called Grand Finale, of its epic exploration of the Saturn system. On 22 April, it made its 127th and last flyby of Titan, while on 26 April it dived for the first time through the gap between the planet and its visible rings, successfully returning data from a region it has never dared to explore before. Cassini’s new orbit sees it make another 21 weekly dives until, come 15 September, its almost-20 years mission ends with a fiery plunge into the Saturnian atmosphere. The Sun’s northwards progress during May, to within only 1.4° of its most northerly point at the summer solstice, changes the sunrise/sunset times for Edinburgh from 05:29/20:52 BST on the 1st to 04:36/21:46 on the 31st. The Moon reaches first quarter on the 3rd, full on the 10th, last quarter on the 19th and new on the 25th. This crescent Moon on the 1st lies in the west, between the stars Pollux in Gemini and Procyon in Canis Minor, lower to its left, while on the 2nd it is 4° below-left of the Praesepe star cluster in Cancer, best viewed through binoculars. It lies near Regulus in Leo on the 3rd and 4th, and appears only 1.2° above the conspicuous Jupiter on the 7th. The giant planet lies 10° above-right of Virgo’s leading star Spica and edges 2° to the west-north-west this month, drawing closer to the celebrated double star Porrima whose two equal stars orbit each other every 169 years but appear so close together at present that we need a good telescope to divide them. Following its opposition on 7 April, Jupiter recedes from 678 million to 724 million km during May, dimming slightly from magnitude -2.4 to -2.2 as its diameter shrinks from 43 to 41 arcseconds. Any telescope should show its changing cloud-banded surface while its four main moons may be glimpsed through binoculars, although sometimes one or more disappear as they transit in front of the disk or are hidden behind it or in its shadow. Some 30° above and to the left of Jupiter is the orange-red giant star Arcturus in Bootes the Herdsman. At magnitude -0.05, this is (just) the brightest star in the northern celestial hemisphere ahead of Capella in Auriga, low in the north-north-west at our map times, and Vega in Lyra, climbing in the east. It is also one of the closer stars to the Sun, but it is only a temporary neighbour for it is speeding by the solar system at 122 km per second at a distance of 36.7 light years. Even so, it takes 800 years to move a Moon’s breadth across our sky. 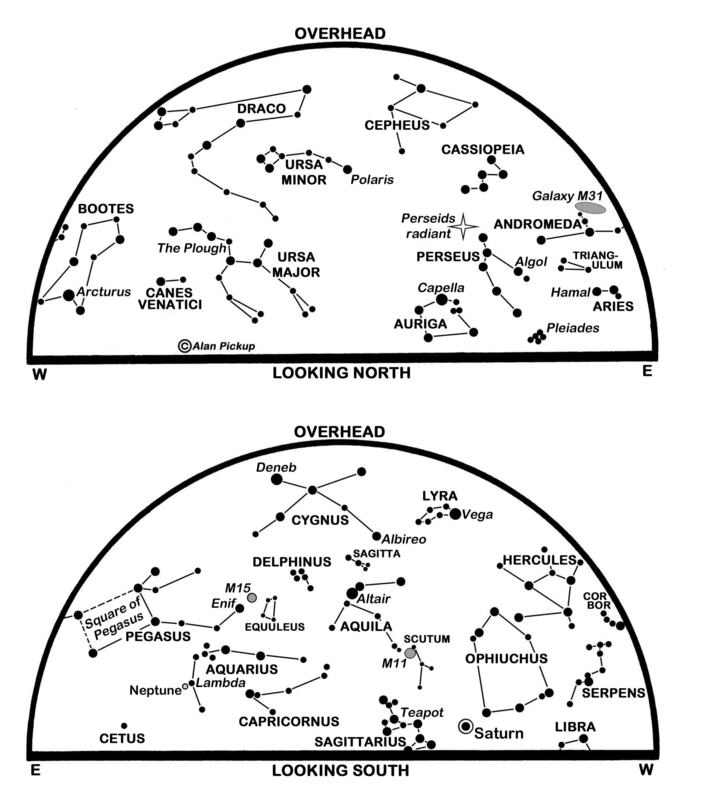 It is also a corner star of a rarely-heralded asterism dubbed the Spring Triangle – the other vertices being marked by Spica and Regulus. A useful trick for finding Arcturus is to extend a curving line along the handle of the Plough which passes overhead during our spring evenings but is always visible somewhere in our northern sky. That line, still pending, leads to Arcturus and then onwards to Spica. The traditional mnemonic for this is “Arc to Arcturus, spike to Spica” but, given current circumstances, we might amend this to “Arc to Arcturus, jump to Jupiter”. Venus rises 65 minutes before the Sun on the 1st and climbs to stand 9° high at sunrise. By the 31st, these figures change only a little to 75 minutes and 10°, so it is far from obvious as a morning star, even though it blazes at magnitude -4.5 to -4.3. Through a telescope, it shows a crescent whose sunlit portion increases from 27% to 48% while its diameter shrinks from 38 to 25 arcseconds. Early rises, or insomniacs, can see it left of the waning Moon on the 22nd. Mercury stands below and left of Venus but remains swamped by our dawn twilight. It is furthest west of the Sun (26°) on the 18th. Still visible, but destined soon to disappear into our evening twilight, is Mars. Shining at a lowly magnitude 1.6, it lies 7° above-right of Aldebaran as the month begins and tracks between the Bull’s horns as Taurus sinks below our north-western horizon in the early evening. This is a slightly-revised version of Alan’s article published in The Scotsman on May 1st 2017, with thanks to the newspaper for permission to republish here. One of the brightest and closest supernovae since 1987 was discovered by a student group from University College London at an observatory in north London on 21 January. Meanwhile, Jupiter is unmistakable in the best evening sky of the year and both Mars and Venus are conspicuous before dawn. The supernova, the catastrophic disintegration of a white dwarf star, is located in the galaxy M82, some 11.5 million light years away in the constellation of Ursa Major. 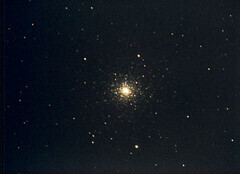 At its brightest, perhaps as February begins, it may be shining at about magnitude 10.0. This is too dim to target through binoculars, unless you use large ones under a perfect sky, but it is easily seen through most amateur-owned telescopes provided we know just where to look. At the star map times, M82 and its sister galaxy M81 are located 8° above the star Lambda high in the north-east at the end of the winding constellation of Draco. M81 lies 0.6° south (right) of M82 and is larger and brighter at about the seventh magnitude. M82 is the more interesting of the two because it appears to be a spiral galaxy in the throes of unusually rapid star formation – indeed it is classed as a starburst galaxy. Perhaps triggered by a close encounter with its neighbour, the episode means that M82 has a surfeit of luminous young stars and star clusters and, consequently, may host more than its share of supernovae. We may now expect the current supernova, dubbed SN 2014J, to dwindle to obscurity over the coming months. Eventually, though, its debris may add another twist to the complex network of dusty filaments that do their best to hide M82’s spiral structure. It is interesting to note that all four of the brightest supernovae since 1993 have occurred in different galaxies in Ursa Major. Jupiter stood at opposition on 5 January and is conspicuous as it climbs from the east at nightfall to stand high on the meridian at our star map times. Meanwhile the glorious shape of Orion the Hunter marches from the south-east to the south-south-west, followed by Sirius which lies 40° almost due south of Jupiter and is less than half as bright. Orion’s Belt points upwards to Aldebaran and the iconic Pleiades cluster and, as Orion stands at his highest in the south, look almost overhead for the bright star Capella in Auriga. 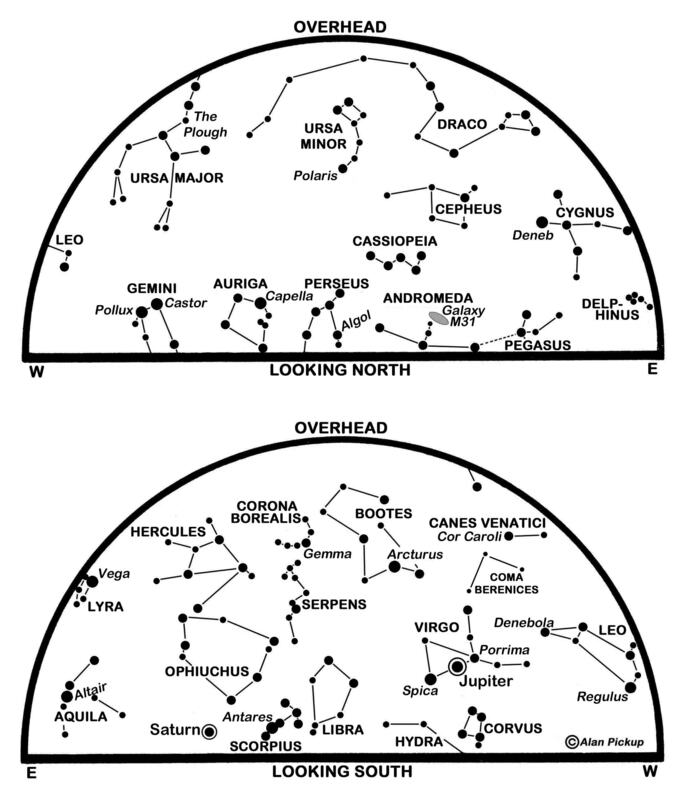 Besides the Pleiades, three other open star clusters are plotted on our southern star map. 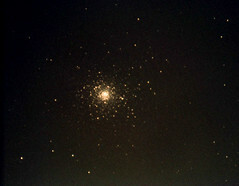 Praesepe, or the Beehive cluster, in Cancer is the brightest of these and best seen through binoculars. Look also for M35 near the feet of Gemini, and currently 10° to the west of Jupiter, and the slightly brighter M41 4° due south of Sirius. There is still a chance to spot Mercury as it nears the end of its best evening show in 2014. Forty minutes after sunset on the 1st it stands almost 9° high in the south-west and 7° below the slender young Moon. Use binoculars to find it at magnitude -0.4, although it may become a naked-eye object before it sets in the west-south-west another 70 minutes later. By the 8th, though, the small innermost planet is 2.5° lower and one fifth as bright at magnitude 1.4 as it disappears into the twilight on its way to inferior conjunction on the near side of the Sun on the 15th. Sunrise/set times for Edinburgh change from 08:07/16:46 on the 1st to 07:07/17:44 on the 28th. The Moon is at first quarter on the 6th, full on the 14th and at last quarter on the 22nd. It was new on 30 January and as it emerges in our south-western sky in early February, expect earthshine (“the Old Moon in the Young Moon’s Arms”) to be impressive. It is caused, of course, by the night side of the Moon’s disk being illuminated by the almost-full Earth in the lunar sky. The phenomenon will have disappeared before the Moon stands 7° below the Pleiades on the 7th, close to Aldebaran on the 8th and right of Jupiter on the 10th. Jupiter dims from magnitude -2.6 to -2.4 as it creeps westwards in Gemini and shrinks to 42 arcseconds if viewed telescopically. 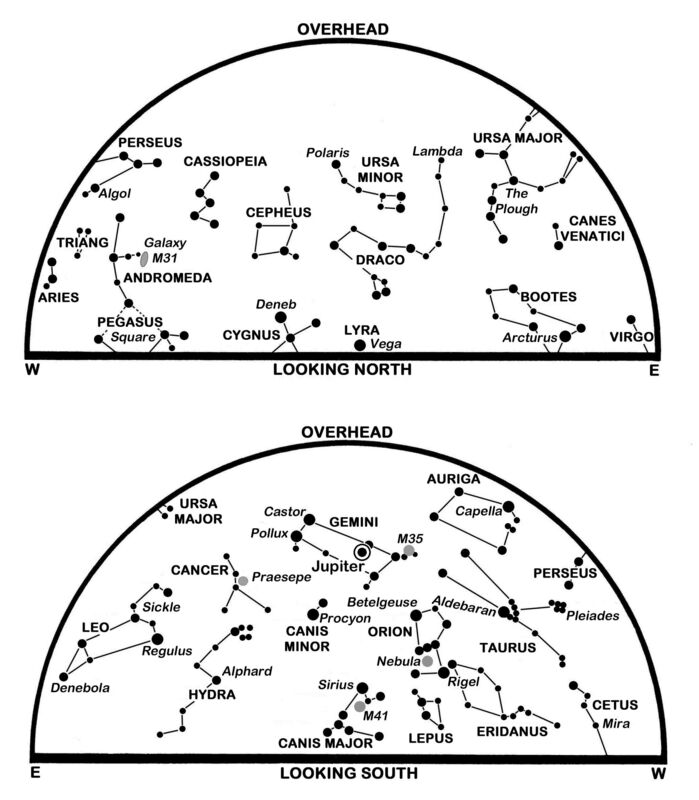 With its active meteorology and four bright moons, it is a favourite for amateur observers, particularly now that it is highest in the evenings. The magnitude 3.6 star Lambda Geminorum, 9° south-east of Jupiter, disappears behind the southern limb of the Moon on the 11th. 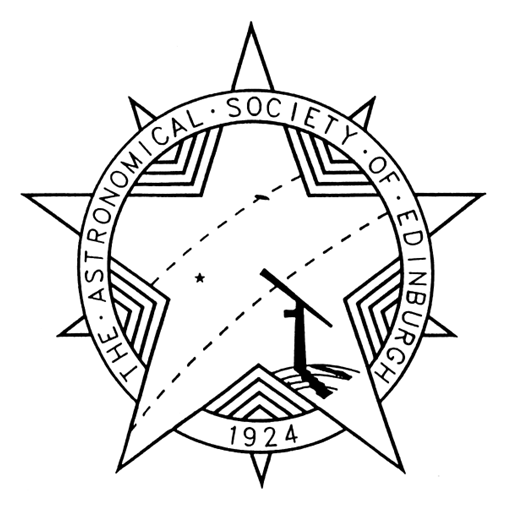 As seen from Edinburgh, the occultation lasts from 19:55 until 20:51. Mars doubles in brightness from magnitude 0.2 to -0.5 as its small ochre disk swells from 9 to 12 arcseconds this month. The Red Planet is tracking eastwards 5° to the north of Spica in Virgo, rises in the east about ninety minutes after our map times and crosses Edinburgh’s meridian at a height of 26° almost six hours later. Saturn follows Mars across our southern morning sky to pass 17° high in the south at 06:50 on the 1st and almost two hours earlier by the 28th. The Moon is near Mars and Spica on the 19th and 20th and closest to Saturn on the 21st when Saturn is magnitude 0.5 and 17 arcseconds wide, with the rings tipped at 23° and 39 arcseconds broad. Venus, at its brilliant best at magnitude -4.6 on the 11th, rises above Edinburgh’s horizon in the east-south-east at 05:58 on the 1st and 51 minutes earlier by the 28th. 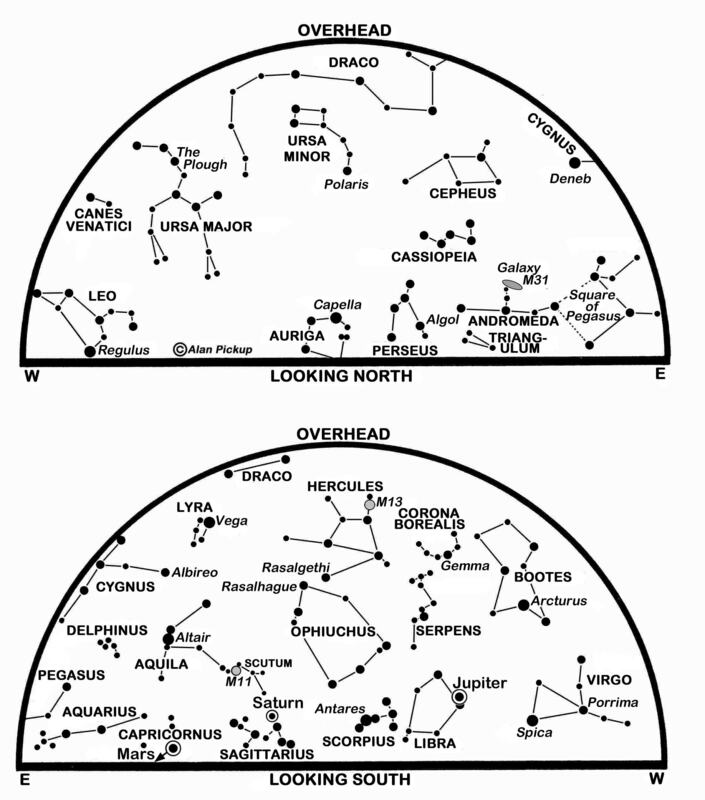 Look for it low in the south-east before dawn and catch it close to the waning Moon on the 26th. This is a slightly-revised version of Alan’s article published in The Scotsman on January 31st 2014, with thanks to the newspaper for permission to republish here.